We upload old postcards and beautiful antique hairpins almost everyday! I was born in 1981 and I am very interested in ancient Chinese women's costume. I have collected a lot of postcards featuring Chinese women and girls sent from China in the late 19th-early 20th centuries. These were written in different languages - Japanese, English, German and especially French. They paint a very colourful picture of Chinese society and culture in the late Qing Dynasty. For China this influx of foreigners may have been a big challenge, perhaps even a tragedy, for its history and politics. However, foreign cultures have left a lasting footprint that endures up to today and postcards from those days provide the best evidence of the complex relationship between China and the outside world. 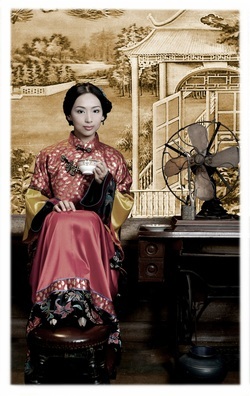 Shown here are some postcards featuring beautiful women from early-modern China (1895-1930). They were written by foreigners who were living in, or visiting, China. Some of these foreigners were missionaries, soldiers or businessmen. This is history written by ordinary people, not the history that can be read in official history books, and paints a very different picture of everyday life. From the messages on the postcards we can read history as it was happening. Their real lives are frozen in their own handwriting and will endure for as long as the postcards remain legible. Chinese beauties old postcards album, full of fully dressed women. Most of them are prostitute, and some of them are high class women. While we enjoy their beautiful pictures now day and appreciate their embroidered dress and very decorative hair style. We can never know the life behind their pictures with no human right in that time. Prostitute's life was extremely tragic.Their was a big contrast between what we see and their real life. Please enjoy the postcards here!! If you have any ideas you want to share, or suggestions how to make this site better, please Mail to me.